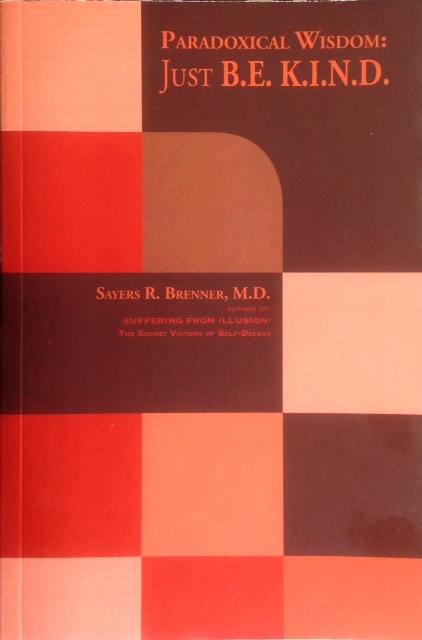 Paradox Books – Sayers R. Brenner, M.D., P.A. Brenner, Sayers R. (2015). Paradoxical Wisdom: Just B.E. K.I.N.D. Sarasota: Paradox Books. Ultimate answers can be deciphered by anyone along any pathway. Enlightenment is free, indeed, but it comes at the cost of all our pain-free and Utopian illusions, a price that few are willing to pay. Life’s painful disillusionments force us into the counter-intuitive opportunity of a lifetime: to train ourselves to cultivate, instead, a taste for paradoxical insights. These poetic fusions or integrations of opposites are the closest we can get to an ecstatic harmony with what is. This changes everything! First, it enables us to expose and evade life’s intricate “con-game,” which makes fools of us all. This book offers a simple seven-step mantra-mnemonic: “B.E. K.I.N.D.” (paradoxical Balance, Embracing acceptance, lovingKindness, Insight, Now, Disillusionment, and Deflation). This practical B.E. K.I.N.D. reminder serves as a cypher or tutorial which we can recite to ourselves in any moment and amidst each adversity to train ourselves to better resonate with and enjoy this exquisite cosmic symphony. Enlightenment is simply more fun. “(Dr. Brenner) examines the conscious and unconscious reasons behind masochism and exposes the secretive inner rewards of the self-defeater. Most importantly, he proposes ways toward enlightenment. I recommend this book highly.” Vamik D. Volkan, M.D. “…a vivid picture of those who attempt to deal with their deep inner rage at an unfair parent by pursuing revenge-seeking self-defeat… Psychotherapists and their patients/clients will particularly benefit from gaining hope for recovery by learning the key to resolving this tragically common human condition.” David S. Fuller, M.D. Very sad to let you know that my husband, Dr Edward Sanford, the love of my life, passed away on Tuesday January 16, 2018 and was buried at Beth Sholom Cemetery in Sarasota on Wednesday January 17, 2018. Yaffa has become my emotional support now. Is there any possibility for me to see you at your earliest convenience?